Loving aunt and sister-in-law passed away Wednesday, April 4, 2018 at Covenant HealthCare Cooper Campus. Age 88 years. Daughter of the late Jacob and Anna (Weigandt) Fahrenbruch, Eleanor was born May 28, 1929 in Saginaw, Michigan. She was married to Frank Dvorak on June 18, 1949. He predeceased her October 28, 1997. Eleanor was a beautician. She was a member of Holy Spirit Catholic Church and enjoyed knitting, crocheting and reading books. Surviving are her sisters-in-law, Alice Zeitler, Betty and Elmer Blehm, Charlotte Dvorak and Beverly Dvorak; several nieces, nephews and cousins, especially Jim Fahrenbruch whom was with her in good times and bad. Eleanor was preceded in death by two sisters, Elsie Abeln and Esther Bamberger; her brother, Jacob Fahrenbruch; sisters-in-law, Mary Goodspeed, Emily Kennedy, Jinny Dvorak; brothers-in-law, William Dvorak, Charles Dvorak, Robert Dvorak and Lloyd Zeitler. Funeral Liturgy will take place 11:00 a.m. Monday, April 9, 2018 at Holy Spirit Catholic Church, 1035 N. River Rd., Saginaw. Rev. Fr. Peter J. Gaspeny will officiate with entombment in St. Andrew Mausoleum. Friends may visit at The Snow Funeral Home, 3775 N. Center Rd. (between Shattuck and McCarty), where the family will be present on Sunday from 1:00 p.m. to 6:00 p.m. and at the church on Monday from 10:00 a.m. until time of Mass. Those planning an expression of sympathy may wish to consider memorials to Holy Spirit Catholic Church. 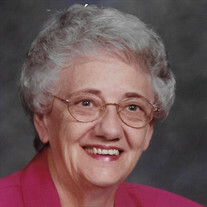 To send flowers or a memorial gift to the family of Eleanor I. Dvorak please visit our Sympathy Store.